For those who don’t organize it themselves, bus transportation to school can be both a blessing and a curse. On the one hand, you’re glad to save time in the morning by not having to drive your children to school, but on the other hand, there are often strict district rules for busing that sometimes makes things difficult. School bus companies often provide private school bus services, i.e., you don’t have to be a school district to contract school bus services. That means that private schools or private groups can get together and attain customized school transportation services with all of the pluses and none of the rigid, district wide rules. Nowadays, many parents of children in private schools are pooling their resources and hiring their own school bus transportation to provide service that’s perfectly customized to meet their needs. In doing so, you set the student transportation eligibility criteria for your children! 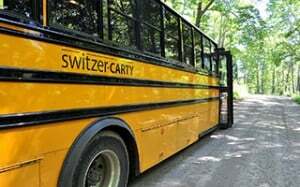 Many people worry that it’ll cost too much money to arrange for private school bus transportation. The reality is, split over a group and versus providing your own transporation, school bus services can be extremely affordable. Often, the cost is only a few dollars per day per student (comparable to city transit, if it’s even available) and with high service levels. If you’re in Ontario and would like to learn more about private transportation services and costs, find out now! When parents arrange for private transportation for the kids in their school, it’s possible to customize the pickup routine to suit your needs and budget. For example, many groups like to save time and stress by having their kids picked up and dropped off at home. It’ll save you lots of time in the mornings if all you have to do to get your child on their way to school is literally open the front door and wave as they board the bus that’s just arrived in front of your home. This is also a great way to make sure your kids stay warm in winter, or dry on a rainy day, since they can avoid walking outside to a central meeting point for pick up. If maximum cost savings are needed, trim costs by having the bus make a small number of central stops to pick up a few kids at a time. Think of it as having your own “bus stop” that kids in the area will meet up at to board the bus. Additionally, if you’re paying for it – rather than a school district that may not fully understand your needs – you’ll have a say in the rules including what happens if you or your child are running late, and the ideal pick-up/drop-off times. If your group opts to have a central pick-up location, it’ll be decided based on what works best for all of the families involved, rather than be based on how the local school district has always done it. Good communication with all parents involved is a key factor in putting together a bus routine that works. In some cases, the school’s parent council committee can handle organizing all the details. In other cases, the parents of all the children to be bussed get together to come up with a good plan. Confirm where everyone lives so that pick-up and drop-off locations can be sorted out. Make a list of all the children that need to be transported and jot down the number of kids so you’ll know how large of a bus is required. Get price quotes for central pick-up areas where only a few kids will be picked up at a time, and compare to the cost of picking up every child directly from their home. Don’t make the mistake of thinking that just because your child is in private school, you have to drive them there yourself every morning (and deal with the added rushing around that you really don’t need in your morning routine). Lots of parents have discovered the ease and convenience of pooling their resources to arrange for private bus transportation to and from school for their kids – and you can too.